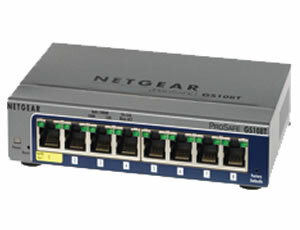 Joining NETGEAR's family of Gigabit Smart Switches with web-based management, this 8-port Gigabit switch is high on value and capability. With 8 10/100/1000 Mbps ports and support for jumbo frames, capable of powering 2000 Mbps of data throughput in full-duplex mode, it is ideal for small offices or extensions and connects high speed servers or power users. Ideal for combining 10, 100, and 1000 Mbps devices it delivers automatic speed and full/half-duplex sensing plus Auto Uplink on every port. In addition, an intuitive web-browser interface offers the simple Smart Switch management, making it easy to configure ports and set up port trunks, VLANs and traffic prioritization or monitor switch performance. Alternatively, use SNMP-based software to manage your Smart Switch. Flow control, auto-sensing per device, DHCP support, VLAN support, auto-uplink (auto MDI/MDI-X), IGMP snooping, Syslog support, traffic shaping, DoS attack prevention, port mirroring, DiffServ support, store and forward, Broadcast Storm Control, Multicast Storm Control, Unicast Storm Control, firmware upgradable, SNTP support, Rapid Spanning Tree Protocol (RSTP) support, Multiple Spanning Tree Protocol (MSTP) support, Access Control List (ACL) support, Quality of Service (QoS), Jumbo Frames support.